Imagine, cutting small cubes of this dark balsamic jelly to decorate your desserts and your recipes will come to life. Not only because of the color and the flavor, but also because of the moving jelly cubes. 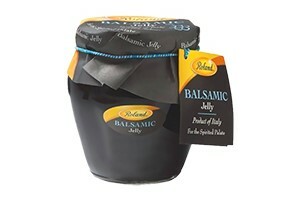 Other ways to use this balsamic jelly is on meat and chicken, with cheese and pate. Roland made with jelly with balsamic vinegar wine. Ingredients:balsamic vinegar wine, sugar, lemon juice, natural apple pectin.